Chair Nils Jensen commented to the Times Colonist on September 3, 2015, justifying a near 100% increase for CRD Director pay. The Chair stated: “this is the first time in 20 years that there’s been any proposed adjustment at the CRD, so it’s a 20-year catch up”. Why would any body of public officials wait so long to review their pay and then expect to double it in one year? 2. Why are CRD Directors paid for meetings they don't attend? The renumeration of the CRD Directors is fixed, and those who miss meetings are paid regardless. For example, in 2014 a member of the Core Area Liquid Waste Management Committee failed to attend a single committee meeting, yet he was paid the same as Directors who attended. Another member of the same Committee attended 3 of 11 meetings, yet was paid for attending all meetings. This puts an unfair burden on Directors who attend meetings, and is also unfair to residents of Greater Victoria who expect these CRD appointees to fulfill their civic obligations in a responsible manner. At minimum, CRD Directors should not be paid for missed meetings, and if they cannot or will not attend meetings with regularity, they should step down from the CRD. 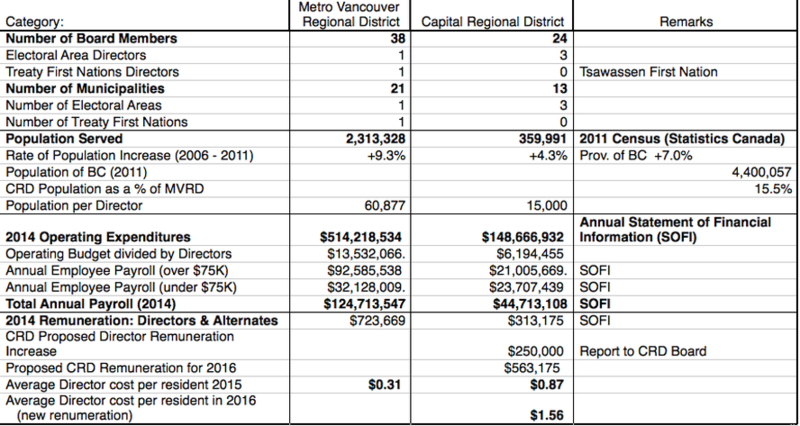 Metro Vancouver Regional District (MVRD) Directors (with four exceptions) are paid based on the number of meetings attended. The Chair, Vice-Chair and Electoral Area Director are paid annual stipends, as are Committee Chairs. All other Board members are paid based on meetings they attend The current rate is $359 per 4 hour meeting, and $718 for meetings over 4 hours (also the daily maximum). This seems a fair method of remuneration, and is tied directly to the attendance hours of each Director. MVRD Directors are paid only for the meetings they attend. CRD Directors from the 7 core municipalities are experiencing more time demands due to the requirement to implement a sewage treatment plan. Using a per-meeting model of payment, all Director remuneration cost related to the sewage treatment could be allocated to the sewage treatment budget, rather than as a fixed cost for Director remunertion. This would place these costs where they belong, as a part of the sewage treatment plan. It is recommended that CRD consider either a model similar to that used by the MVRD or a hybrid model, with meeting fees and stipends significantly less than those recommended. 3. Is the CRD more complex than the MVRD? The CRD Chair also stated that, although the MVRD covers a larger geographic area than the CRD, “in complexity, the CRD is the most complex Regional District in all of British Columbia”. This was intended to gain support for his motion to double Board member compensation. Regional planning for a much larger, more challenging and faster growing region. The MVRD comprises 21 member municipalities, one Treaty Frst Nation and one large Electoral Area. The CRD has 13 municipalities, three electoral areas and no treaty first nations. MVRD 2014 operating expenditure was over $514 million, while the CRD operating expenditure was $148 million. If the 360,000 people living in the CRD have a more complex form of regional governance than the 2.3 million in the Lower Mainland, then the Board should request the Minister of Community, Sport and Cultural Development to include the CRD in the proposed municipal goverance study. A better model may be possible. The timing of the CRD pay increase motion hardly seems appropriate, particularly coming immediately following the failed sewage treatment plan that has wasted close to $70 million over 9 years with no plan in site. And no site in plan. The motion to increase CRD Board compensation was approved 19 – 5. Voting against the motion were Saanich Mayor Richard Atwell, Victoria Councillors Marianne Alto and Geoff Young, Sooke Councillor Rick Kasper and Langford Councillor Lanny Seaton. Councillor Alto indicated she would refuse the pay increase.